Sometimes we meet people who are truly so talented that we can see greatness leaking through them. They might not have done anything amazing in their life yet, but looking at them, you just know they are going to be really successful some day. Cafe Terrace at Night was that painting for Van Gogh. 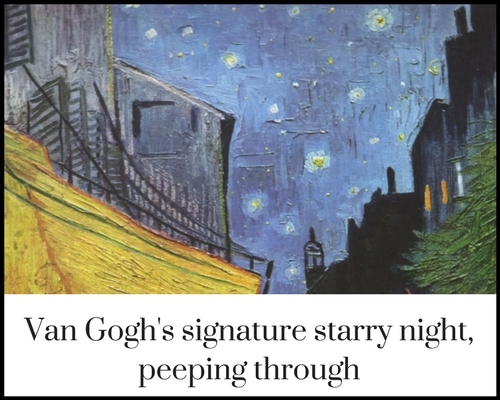 It was the first time he painted the starry night, even if it was just for a small part of the painting. His world-famous painting The Starry Night and The Starry Night over Rhone was done just a year after this one. 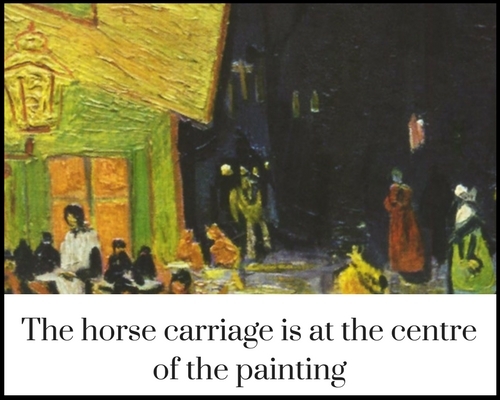 A part of the post impressionism art movement was that artists didn’t paint exactly what they saw, they used colours to express their feelings about the subject. 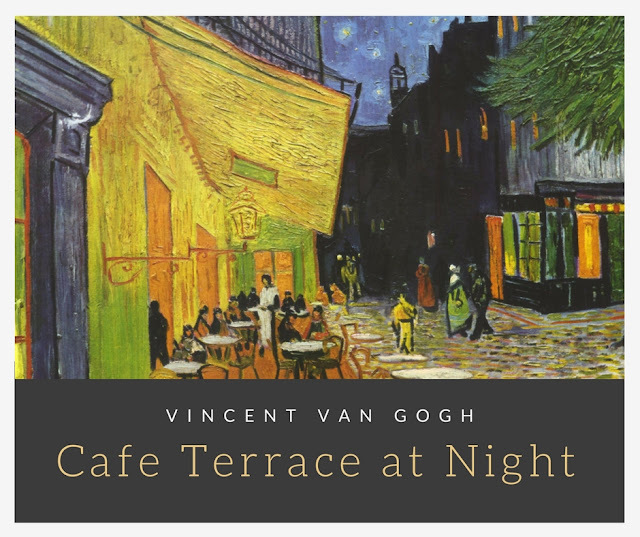 Now called 'Le Café La Nuit', the cafe still exists in the South of France and as you might expect, it is always full of Van Gogh fans. Right around Place du Forum, you can stand at the same place where Vincent set up is easel and see the same scene he painted. Definitely a bucket list location for me. Was Cafe Terrace at Night a homage to The Last Supper by Leornardo Da Vinci? While it might sound like a Dan Brown plot to you, many historians do believe that Van Gogh hid a secret homage to Da Vinci’s The Last Supper. On close inspection of Van Gogh’s painting, historians found out that the main characters include one central figure with long hairs (like Jesus) with 12 individuals and a shadow figure. While I am not sure that is true or not, I do know that Vincent was religious and he often used religious symbols in his paintings. But that’s a story for another day. 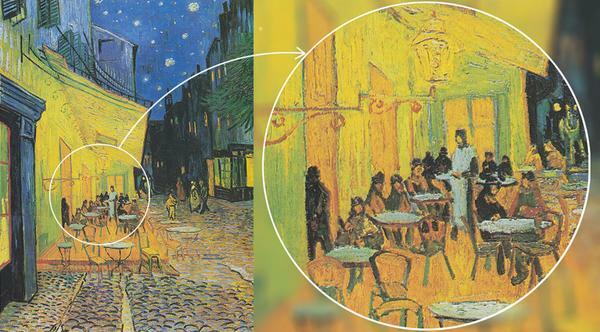 For today, fall in love with Vincent Van Gogh’s interpretation of a French cafe and a starry night. It is a reminder that you have the potential in you, even when others cannot see it yet. So if you are slugging away for a dream that nobody thinks is possible, then tell them there was a time when people thought Van Gogh was a crappy artist. The art stayed the same, only the perspective changed. Agree with your interpretation. Cafe terrrace at night appeals to the romantic soul in me. Would love to visit the real cafe! I have recently been studying what I can find about van Gogh. Thank you for adding your thoughts to the conversation. I found them an interesting addition to what I have already learned. now I have a new appreciation for van gogh's art especially this piece. his other work is often overshadowed by 'the starry night' but I guess that's how it is, we only remember the famous pieces. Again, wonderfully explained. Learning more with each day. About the Dan Brown-ish theory, we can only speculate. I have a theory about it after reading your post. But I must delve deeper into Van Gogh's work before I commit to it! Oh. What's the theory? Now I really want to know!!! Conspiracy theory makes everything so much more interesting! Do you love art? It's like not that teen kind of love but that mad aged couple who grow old together kind of love.Your interpretation of each and every painting is thought provoking. It's like oh, why didn't I see it! I love your last line because it is so true! This is a great work and I think he must have been in 'good" spirits when painting this due to the calmer brush stokes. I don't know if this is a version of the last supper, maybe it's just people out and enjoying themselves. 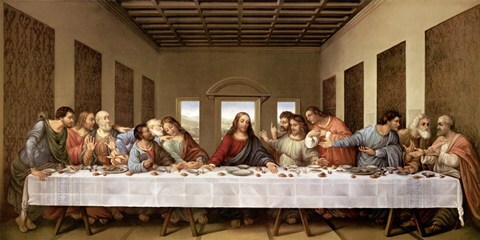 Can I also please say that the theory of a homage to the Last Supper is a case of overlooking for things. The Waiter seems to have some form of head gear on, maybe keeping his ears warm ?. I don't believe it to be long hair. The matter of twelve people is coincidental. The dark, shadowy figure is a play on Vincents belief that the night cafe is a dark place where you 'can go mad or committe a crime' ... As Vincent said about his Night Cafe painting.